Today's decluttering mission is to declutter lost socks, and those without a mate that have been hanging around for quite a while, waiting for their lost match. 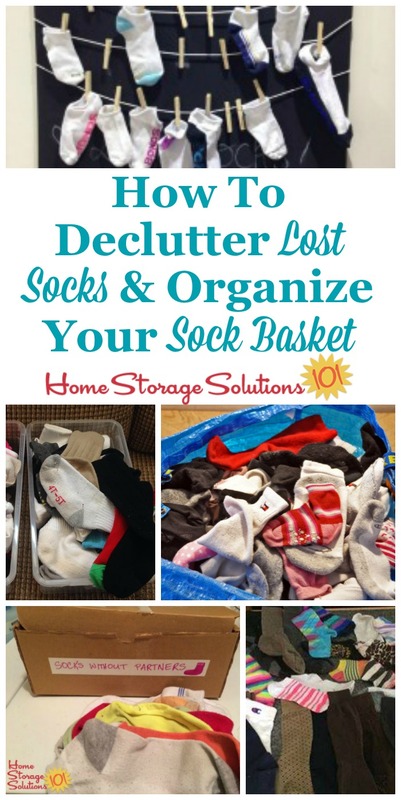 Plus, today you should make a collection area for missing socks, such as in a basket or bag, so from now on as you come across them, when doing laundry, you can hopefully more easily find both parts of the pair, eventually. It never fails, as you're folding laundry, you come across a clean sock without it's mate. One is missing. The question becomes, where to put them until you hopefully come across it's mate, as well as how long should you hold on before you give up hope and toss these loners (or use it for another purpose). My solution -- a sock basket held in the laundry room, or close to the laundry. It actually doesn't have to be a basket though. It can be a bag or other container, or even something you put up on the wall of your laundry room. Whatever works for you and your family, and the space you choose to store this container in. 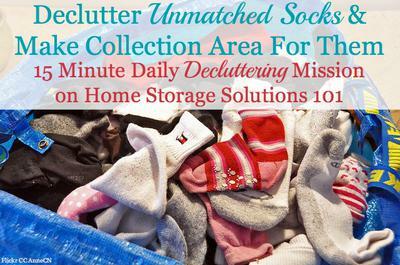 Below I'll show you some ideas from readers of their family's missing sock collection area, plus discuss some routines you can begin so that your sock basket itself does not get out of control. This way you'll have the best chance of matching up those stray socks, and also have good habits in place for giving up on lost socks within a reasonable time so you don't have a huge collection of unmated foot coverings lingering around your house. As one reader, Dawn said, "I once donated a bunch of unmatched socks only to discover a bunch of unmatched socks in a different place later ( the matching socks). I was irritated to say the least. This is a great idea to have a special place to keep the unmatched ones in because then they have a chance to meet up again." 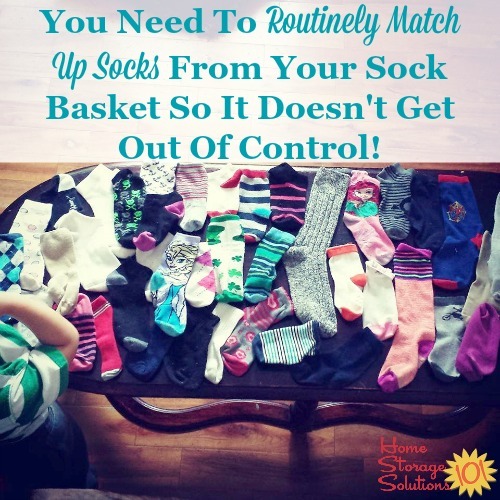 This is a simple concept, but it can make a huge difference in actually letting you find and re-match up your socks. The picture above is from a reader, Holley, who said: "I put them in plastic tubs and let my kids help to find the matches." Holley's container is just about the right size too, in my opinion. Not too small, but no so large that it gets overwhelming with the number of unmated socks you have to sort through. Here's another example of a small box which is a great size for this purpose. 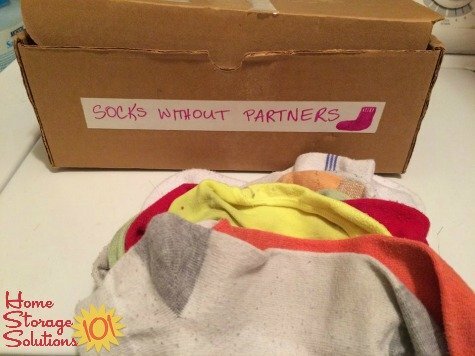 This photo is from another reader, Katherine, who explains: "I labeled an old shoe box 'Socks Without Partners.' When I have a load of laundry that has some socks that don't have a partner, I look in my Socks Box to see if the mate is there. If not, I put the sock in the box to match up later. I have matched up several pairs of socks this way. I find it helpful since I have a teenage daughter that loves to leave her dirty laundry all over her room. It may take a month or more for some of the missing socks to turn up, but eventually, they usually do turn up." Basket, or small tub (as shown above). One reader, Susan says: "I keep plastic bin on the shelf above the dryer. It's labeled, "Sock Widows," since they're missing their mate." 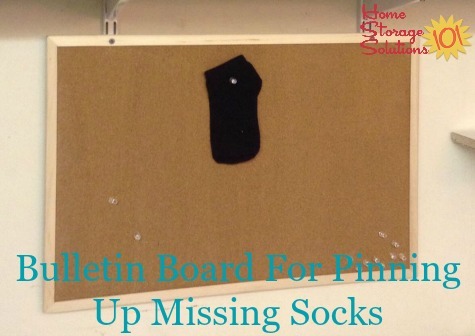 Bulletin board (this idea was shown below, by a reader, Karen, such as pinning missing socks to the bulletin board so you can visually see which socks you're looking for. Indoor clothes line - this is a similar idea to the bulletin board. 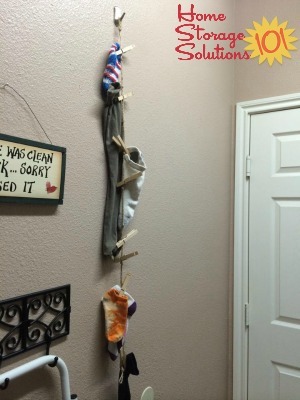 The photo on the right is from a reader, Danielle, who showed us her missing socks clothes line in her laundry room. In addition, above is a photo from Karina, who explained about this idea: "I made this and have it on the laundry wall. Just a cheap canvas with blackboard paint, string and pegs. Seems to work quite well." Where You Should Keep Your Sock Container? You can keep your container in whatever place is convenient for you, but I suggest a place close to the laundry room or washing machine and dryer if you can. After all, you will be coming across these socks as you finish up the wash, and are actually folding the clothes, so this is often the most convenient place for the whole family to put them. 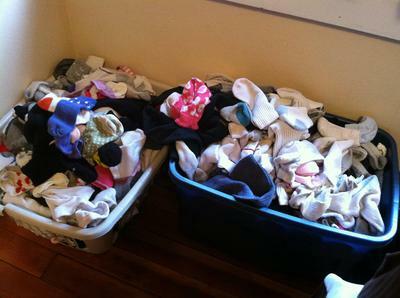 Here's a picture from a reader, Dee, who said: "Here are our messy, unmatched sock baskets (for 7 people)." Looks a bit overwhelming to sort through, doesn't it? I hope I've convinced you to create a collection area for your lost socks now, but I do have a word of caution. You can easily begin collecting way too many stray socks, or get in the habit of never pairing your socks back up if you use this method, and that is a recipe for disaster. One reader, Rhonda, said something rather typical of this particular problem: "I don't know that I'll ever master this one. We have 3 baskets full of unmatched socks! The boys and my husband will just pull unmatched (but close) socks and wear them. It makes me crazy! I keep threatening to throw them all out, but I never do it. Maybe I'm the problem...LOL." If you choose way too large containers for your sock basket it's easy to just let them pile up, sometimes for years and years. Trust me, if a sock hasn't shown up in a year, it's time to let its mate go! Plus, I know some people just dig in their baskets for a pair of socks each morning, or even grab two mismatched ones to wear (which is somewhat a trend right now among kids anyway), but this wastes so much time each morning, if you added up all the time you or a family member are doing this. I definitely don't suggest it as a method. 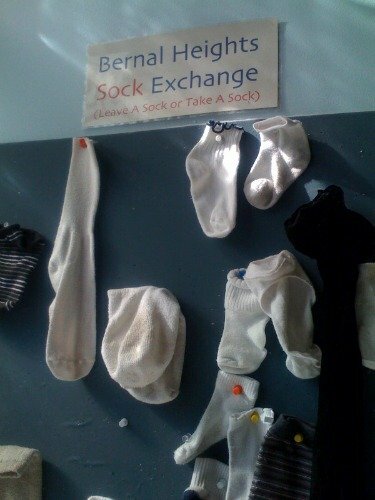 You can donate socks, throw them away, or repurpose them. Whatever you choose -- just don't let them sit around in this container for ages. You don't actually have to do this habitual organizing task yourself either, which is the beauty of it. 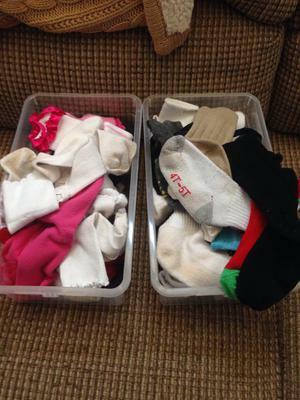 Matching up socks is a simple task for even young children to do, and can relieve some burden off yourself. Just remember to ask them to do it once a month, or every week, whatever you choose. Of course, if you do decide to do it yourself this is a fun excuse to put on some fun music or watch your favorite TV show while you sit there with your basket and match. This task is rather simple and mindless and allows you to get some needed relaxation while still getting something accomplished. Do You Want Ideas For How To Keep From Losing Socks In The First Place? 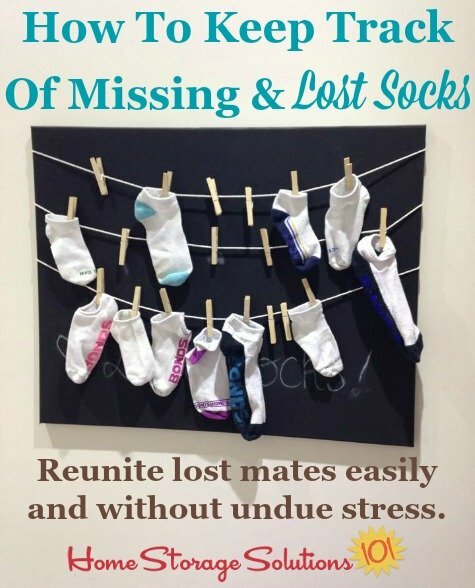 This article has been focused on what to do when you have missing or lost socks, so you can keep track of them until you find the mate. But, did you know there are some techniques you can use to prevent losing socks in the first place while doing laundry? I've discussed 3 ways to prevent missing socks in the wash here, so check it out since this is another way to keep your household's socks under control. Eventually, you may have to get rid of some of those socks without a mate, if the mate never materializes. 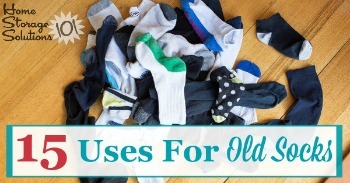 If so, check out this article with ideas and uses for old socks, so you can repurpose them around your home! 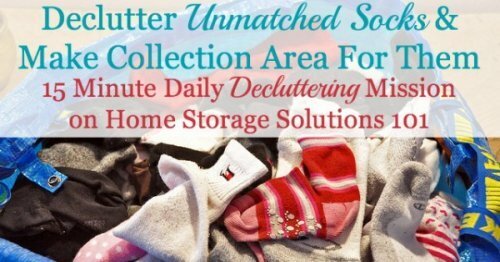 I hope this has inspired you to declutter your lost and missing socks, and get a handle on finding and rematching them back up again more easily in the future. how long do I keep stray socks? MONTHS! I keep hoping and wishing that I soon would find the other one; what if I threw the one I have away, and then found its partner? I have been known to keep socks for a whole year in hopes to find their mates. You will never find the other half till you throw one away. It's been over a year since I tackled ours. Two black garbage bags! the mate only appears when the other is thrown out! It doesn't matter how short or long you keep them because as soon as you throw it out the other appears mysteriously. I am OCD, undiagnosed, but this is a complete pet peeve for me. I don't understand unmatched socks. I have tried this, and end up so frustrated, I end up throwing them away. Sorry. As I dry my clothes in the dryer and outside I have chosen to put odd socks in a bottom drawer in my bedroom dresser. As I put clothes away, I put odd socks in the drawer..out of sight. Then, periodically, I empty the socks into a container and sort as I watch tv, guiltlessly. I keep my son't mismatched in a sling pack he doesn't use and I keep mine in a small tub, they eventually appear once my daughter does her laundry. My husband just piles his in a corner by his side of the bed which drive me crazy. BUT after a couple of months if I see the same socks havne't been reunited then instead of just throwing them out, I put the sock on my hand spray some furniture polish and use a sock or two to do dusting. Then I throw out. I feel it was a waste if I had already washed it, I try to recycle it that way! Also, if your kids go away to camp...using mismatched, but close enough, socks is the easy way to just not worry about it if the sock don't come home or if they come home and they're going to end up in the garbage anyway since they're black from mud, lake, grime, etc. I use a small plastic bag. I keep this in my bedroom. I fold and sort on my bed and when I find a missing sock I grab my bag that is in my bedroom and I search for a mate. Most the time I find mates. If I have washed all the laundry and I haven't found a sock I'll get rid of it. For example, one time I had some baby socks that I was waiting to find mates for and when I had all the laundry done and they were no baby socks, I got rid of the sock. I found best solution....3 boys in house .....each has twelve pair same brand and colour....same with undies....one will have black, stripes and white. Works for me. I buy my kids the same socks. For example, my son likes the black no show, - I always buy the same kind. So, when I do laundry, it is easy to match up as they all match! When my kids were young we had a "sock party" once a week where the four would get together to match socks. Then we would have a special treat and watch a tv show together. As adults they śtill talk about what fun we had at "sock parties"
I have 5 kids, same overwhelming sock feeling! I bought a clear shoe holder that hangs over the door (affiliate link). I put the sock in this as I find them in the laundry. The first (lowest) row is the youngest, 2nd row 2nd youngest etc. I have 1 or 2 pouches in each ones row for miss matches. That way when I find one I can see if the match is in there. The other pouches are filled with matched socks. This has been a huge time saver for me. I have only been doing it for about a month but it is so easy and so helpful!!! I hang it on the laundry room door by the way. I have a lingerie bag (affiliate link) for each of my 6 kids. As they take off their socks each night they put their socks in, wash them in the bag, and voila they don't come up missing! I had the same problem with gloves. Then I was told by a friend that she only buys one kind and color of socks and gloves for her kids. (She has 6). Now every sock and glove matches. Problem solved. We have a sock pillow. I bought a big pretty pillow cover from Pottery Barn and store mix matched socks in there and every few months sit down and sort through them to see if any matches turn up. Pay your children like I did to mate the socks. When they want extra cash they seem to get them done pretty fast. restart the basket at the beginning of each school year! At the beginning of every school I throw away any stray, old or torn sock and start the sock basket all over again adding/replacing with new socks after checking their supply! Has worked out pretty well. I bought a small round laundry basket from Dollar Tree. It sits in the space between the top of my washer and the wall. When I come across a stray it gets tossed in there. When the basket is full it gets sorted through. About every 2 weeks. I use a hanger with clips attached to it. As soon as the socks are washed and are ready to hang dry I gather all the socks on one end then shake 3 times then stretch so that the end toe will come out. I lay them down on top of a flat surface and find their missing twin sock, them hang them together. This way, the socks appeared just like iron pressed and much easier to fold. love the bulletin board idea! I love the idea of the bulletin board. I raised 4 children and always had a large sock basket. Most of them remained orphans for years. They resided in the basket, out of sight, out of mind. Pinning the loose sock to the bulletin board at the dryer helps you remember you have an orphan sock, keeps you from having to go sock diving in the basket. It's in front of you and you don't have to try and find them later. When their mate is found inside someone's jeans everyone knows where to find the mate without any extra effort. I would have used this method. I use a small shoebox to store all my single socks. When I finish my laundry I pull out the singles and look for its lost partner. If I see the same single sock more then 3 times, it's time to say goodbye. I have two very full baskets of lone socks that I fervently hope to find mates for. My biggest issue is holding on to the hopeless and irrelevant. I have toddler socks that I (and every other member of my family) push past every day in search of other matching pairs - but my youngest child is now 10! Why?!? Why do I hold on to the ones I *know* I'll never match, and the ones that wouldn't fit anyone in our household anyway, even if I did?!? 2. How many socks do you really need per person? I believe it is 6-7 pairs each. Any more than that and it must be safe to say that there is the beginnings of a sock fetish. 3. Give each person a small lingerie bag to put their socks in as they become dirty. Throw the entire bag in the washer and dryer and let the individual do the matching. No loose socks floating around and the no need to match, unless you want to do so. Harder for that pesky gremlin to get your socks as well. I am working on 1 and 2 and have already started doing 3. The problem is the adults in the house. I have to share how we do this: We have a stray sox box which is a plastic shoe box with a LATCHING LID. This size box is perfect because it limits the number of stray socks, and it is small enough to keep tucked in an end table in the living room because we fold laundry while watching TV. The latching lid is key because it keeps the socks contained. I started doing this almost 10 years ago and we still have the same box AND lid! The widowed socks make great cleaning rags and chalkboard erasers, and this is also a great way to tell if they are permanently single. I hang three lingerie bags, one for each person in the family, near the laundry basket. We put our dirty socks straight into the lingerie bags. When I do a load all I do is zip up the bag and throw it in the washer. The socks are always together. Never had the missing sock problem. I have a big bag hanging on the bedpost at the end of the bed where I sort my washing. Inside the big bag are four smaller bags containing my socks, my husbands socks, my son's socks and my daughters' socks, which I lump together as they're similar size. I put stray socks that have lost their buddies into a basket. If after a month their buddy isn't found they are then transferred to my dusting cloth box. Once they are used for polishing furniture no need to try to wash out the furniture oil, just toss the socks. Socks are easy to use, just slip them on your hand and wipe away. An appliance repair man once asked me if he could take a multicolored sock that was hanging alone over the washer. He confessed that he wanted to place it in the next unsuspecting homeowner's laundry. It may have even been the match she was looking for. Don't throw away orphan socks. Give each person their own color(s), style(s), buy multiples of each. When a sock fades -stretches, or wears - it becomes a dust cloth for their room. After a reasonable period of time has passed and I still can't match up the odd sock I use it as a dust mitt on my blinds. At least the sock gets a little use before it goes to sock heaven! Each family member received 2 mesh, zippered lingerie bags-- separate dark & light socks or second bag for overflow. Person's name was written on each with a permanent marker or fabric paint-- or colored ribbon tied through the zipper pull. Dirty socks were placed in the mesh bags directly from feet or at least before placing in the laundry. Be sure to close the zipper! After the bag of socks was clean and dried, socks were matched and put away. NO STRAY SOCKS! :-) The bags were ready for the next round of dirty socks. Even toddlers can do this. In the grocery store, in the laundry or sewing section and in stores like Wal Mart, there are small plastic sock circles (affiliate link). When you (or your kids or your husband) take off their socks they push them through a colored sock circle and put them in the laundry basket. They are washed dried as a pair. Then when they put them on, they place a sock circle when they can find it when they take them off again. My husband has done this for years and there are no mismatched socks ever. The circles are color coded if each person wants their own color, which helps in sorting. Every couple of months I would declare it was time for a "Super Sock Sort Out." Participation was not optional. We would spread all the socks onto the living room floor then sort them by color, gender and style. It's actually fun to see who can find the most matches. We have 10 kids who are mostly all grown now so with only 2 kids left at home I now use 3 mesh bags and the socks are put into one of these. I have a black, white and a colored bag and the spare socks are sorted by general color. Works for us!!! Buy a bunch of diaper pins and pin the pair of socks together when you take them off. Voila! No more sock widows, and no more trying to match up same colored, but different styles. These can further be thrown into a mesh bag to toss in the washer and dryer. No more trying to separate socks from the rest of the laundry. I worked in healthcare, had a patient with low vision. Her daughter used safety pins to clip her socks together. The pin could be left inside one sock while they're wearing, get put back together and then go in the washer the dryer and back in the drawer that way. I bought sock clips from a company that employs and get people I've been using them for three years, not one lost sock. Prior to that I had a sock orphanage wear socks waited for their mate to turn up. If I get a holy sock it goes in the orphanage the night goes in the red bin. I'm a mother of three. Everyone has different shape and size. I usually put socks in mesh bags to be washed, then hang to dry using two adjacent clothes pins for each pair, this way I know if any is missing from the start. After folding I put away in the designated place for each member, most of the time the missing pair if any is found in the next wash and put back with its mate. I think my socks grow feet and leave the house as I have found them in the driveway and a little bit down the street - is this possible or maybe just a coincidence with my dogs and cats playing with them? I really like your bulletin board idea. Keeps the socks in view so even young children can find socks. My granddaughters have at least 100 unmatched socks. When my son divorced, I decided to help. I put rubber bands around similar socks eg stripes, dots, colored heals etc. This makes sorting easier but I am thinking of dating them somehow, because I agree if no mate shows up in a year out they go. I keep our single socks in a basket in the bedroom. When we have game night, twice a month, I tip the basket on the table and the person that can match the most pairs wins. The children love the game and we keep up with the sock problem. As I pull laundry out of the dryer, I go ahead and pull the socks out into their own basket. When I match the socks, any leftover mateless socks get a single safety pin put on them. The next time I sort socks, if a mate isn't found, a second pin goes on. The next time, a third pin. If the mate isn't found by what would be pin #4, then the sock goes into my scrap clothes bin. Once or twice I've needed to fish a sock out of there that was found under the couch or something, but for the most part, this connects socks with their mates in a reasonable amount of time. The only exception is that if we have several pairs of the same type of sock, I'll put a fourth pin since they're interchangeable and eventually could find another mate again. I have one of those three basket hanging fruit baskets, I store close pens lost socks and miscellaneous items in. And now I have learned from one of my patients who has Macular degeneration, her daughter takes a medium size safety pin and pans her socks together before going in the wash. They go in the washer the dryer and come out matched. I went one step further and when I put my socks on I place the safety pin on the inside of one of my socks, that night when I take them off I pin them right back together and throw them in the hamper. Since then I have learned there are sock clips available that are made by handicap people they are quite expensive if you only order one bag, if you go together with friends in order multiples you get A big discount. I have use the saw clips for 10 years now and have only broken one. My husband only wears certain brands of socks and in one color for each. Kids all together a mess. I use mesh bags to wash each kids socks in. The Bags get sent back to their rooms. If the matches are not in the bags -- they are in their rooms someplace. Not my problem!! 6 grandchildren! Multiple lost socks! Separate styles, Long, shorter, shortest within the same color. Sometimes in helping with the wash there was an accumulation of maybe 50 mismatched socks. This systematic way did help to find mates. Small children can help according to their abilities. Purchase socks with different colored seams for different sizes. I have discovered another possible place for where the missing sock goes! It turns out that when the kids go to their dad's, and the laundry gets done, their clothes are put in with the household laundry and then paired up from the dryer. The almost matches are then packed to come home. But I am the only one who specific matches socks. So a lot of our sock basket has mates at the other house but the other house is ok with their mismatched pairs. I had to let go of my need for specific matches.